Kinesiology is synonymous with food sensitivity testing but that is just one small part of my job. By getting to the root cause of your allergy symptoms, Kinesiology can help calm the immune system and reduce symptoms. An allergic reaction occurs when the immune system overreacts to a substance that has been inhaled, eaten, or absorbed through the skin. An allergy shows that the immune system is seeing an everyday substance as a danger to the body and so is attacking it. Common allergens are cat fur, pollen and wheat, however there is a wide variety of substances that can potentially cause an allergic reaction. Food allergies maybe due to the chemicals in the food. To make a diagnosis of an allergy requires medical tests but Kinesiology can test which foods and substances drain your energy and how to re-balance this. We call this sensitivity or intolerance balancing. If you find that your body is attacking things, do you perhaps feel that the world is an unfriendly place? Are people verbally attacking you at home or at work? Perhaps you feel overwhelmed and small things seem to be insurmountable obstacles. A food allergy can limit your social life and choices about where to go out. Do you really want to stay at home but can’t say no? Do you find it hard to set boundaries? Sometimes our emotional/mental state can effect how our immune system responds. 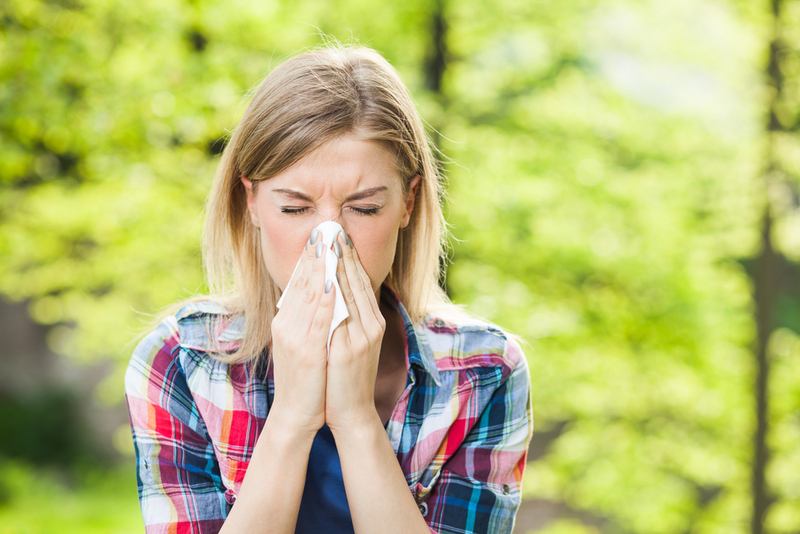 Kinesiology helps release blocked emotions, well the symptoms of hayfever are similar to constant crying anyway! Julian was 11 years old when his parents bought him to see me. For two years he had suffered puffiness around the eyes and swollen lymph nodes. He sneezed a lot and took antihistamines every day in an attempt to control his symptoms. Julian’s family had eliminated chemicals from the house and now were ready to have him tested to see if anything he was eating was causing his symptoms. His body tested that MSG (monosodium glutamate 621 flavour enhancer) was stressing Julian’s system. His mother confirmed that this was an ingredient in his favourite chips. He also tested sensitive to salt, and Julian craved salty foods. I advised him to cut MSG and salt out of his diet. and he was hearing lots of arguments, making him feel unsafe. Since the protective male energy of his father had moved away he had felt confused and unprotected. We used the Australian Flower Essence Fringed Violet to protect him. Julian wrote the affirmation “ I am safe and protected at all times” on to a sticky note to stick on his bathroom mirror to repeat to himself every morning. His puffy eyes made him look as if he had been crying and I asked Julian if he had cried when he had heard his parent’s arguing. He said that he never cried and we joked that although he may not cry, his eyes might. A couple of weeks later Julian ran up to me in the street to tell me his eyes were no longer puffy and he had stopped sneezing. If you would like to see if Kinesiology can help your symptoms please get in touch.